Crude Oil posted the longest run of weekly losses since August 2015, as OPEC member Libya restored production and the surplus in the US shows little sign of slowing or halting. Last week futures finished down 2.4% on the week, a 4th straight declineer. US inventories fell less than forecast last week, keeping supplies more than 100-M bbl above the 5-year average, according to data from the Energy Information Administration (EIA) Wednesday. Libya, exempt from the OPEC-led deal to cut supply, will boost output to 1-M BPD by the end of July, according to the country’s National Oil Co.
Crude Oil fell to the lowest close in 7 months this week as concerns grew that rising US supplies will offset the production curbs by the Organization of Petroleum Exporting Countries (OPEC) and allies including Russia. New non-OPEC output next year will be more than enough to meet demand growth, the International Energy Agency (IEA) said Wednesday in its first forecast for Y 2018. Inventory levels remain stubbornly high, as the things that have caused this trading range remain in place, no change. Implied Crude Oil production has moved North at a rapid pace, US gasoline demand has taken a turn South, as the Summer driving season starts, and total US stocks have not drawn for 2 weeks. Libyan output will reach 900,000 BPD within days, National Oil Co. said on its website, citing Chairman Mustafa Sanalla. 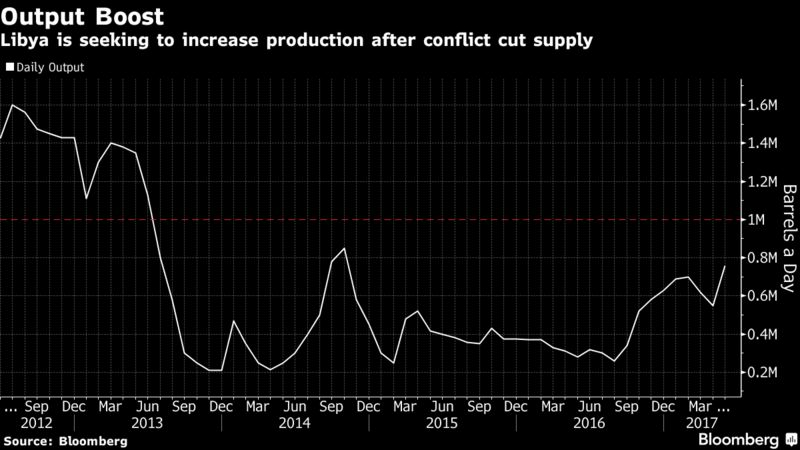 OPEC production jumped last month as Libya and Nigeria revived supply halted by attacks and political crises, a report from the group showed on Tuesday. Canada’s Oil-sands will increase production rapidly in the next 3 years, ranking only behind US Shale as the biggest contributor to global supply growth. Even if Crude Oil stockpiles drop in the next 6 months, concerns may shift, Bank of America Merrill Lynch (NYSE:BAC) said in a report, forecasting Crude Oil in New York will trade at 47 bbl by the end of Q-2.